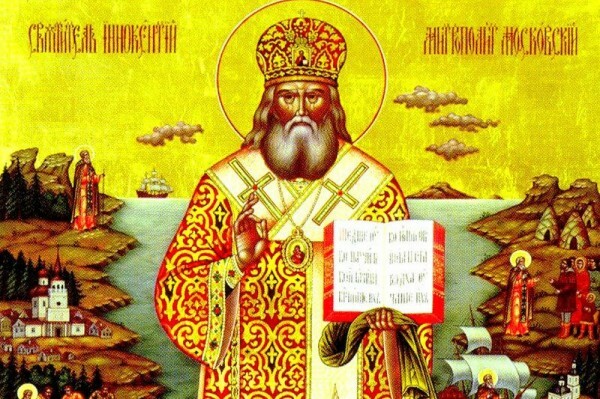 In 1823, the Holy Synod of Bishops of the Orthodox Church of Russia sent out a request for a priest to volunteer for service to the remote Russian colony of Alaska. Not surprisingly, there was no response from any of the clergy who were reluctant to leave their comfortable lives for the remote wilderness.....until the young Father John Veniaminov stepped forward. After a journey of fourteen months, he, his wife, mother, brother, and young son arrived in Alaska on July 29, 1824. The future St. Innocent was born as John Popov near the Siberian city of Irkutsk, Russia. He was born into a pious family whose life centered on their village church. In 1807 at the age of 10 he entered the Irkutsk Theological Seminary and ten years later was ordained a deacon, have first married a priest’s daughter named Catherine. His ordination as a priest came in 1821 and he began his duties at the Church of the Annunciation in Irkutsk. Father John was known even while in seminary as multi-talented as he used his spare time in manufacturing clocks, violins, harps, and barrel organs. No matter what stories he told me about America in general or about the Aleuts in particular, no matter how he tried to persuade me to go to Alaska, I remained deaf: none of his persuasion even touch me. Indeed, how could I – why should I (humanly speaking) have travelled God-know-where when I had one of the best parishes in the city, when I enjoyed the love of my parishioners and the good graces of the authorities, when I already owned my own home and had a larger income than the salary being offered to whomever would be assigned to Alaska. Later that same day we met again in the Bishop’s residence; Kriukov came to say good-byeto the Bishop as well. I happened to be there by coincidence (indeed, it was the first time I had ever been in the Bishop’s drawing room), and Kriukov again began to tell me of the Aleuts’ zeal in prayer and hearing the word of God ( I doubtless had heard the same from him nay times before) when suddenly BLESSED BE THE NAME OF THE LORD! – I began to burn with desire to go to such a people! Even today I recall vividly the tortures I endured while waiting impatiently to inform the Bishop of my wish. Father John and his family arrived on the island of Unalaska to find no housing for his family and a dilapidated church. They initially settled in a native underground hut known as a barabara and Father John set to work in building a suitable church and home. His shared his knowledge and skill in carpentry and masonry with the natives and he personally constructed the altar and icon screen, sewing his own vestments and crafting furniture and clocks. Along with his construction efforts he immediately began to study the culture and language of the Aleut people. Since they had no written language but only an oral tradition, Father John created an alphabet and began translating the Scriptures and Orthodox liturgical services and wrote an instructional pamphlet “The Indication of the Way into the Kingdom of Heaven”. In his missionary work, he did not try to impose a Russian culture on the Aleuts but respected their language and traditions, incorporating them into their practice of the Orthodox Faith. Along with his work as a priest, missionary, carpenter and linguist he took an interest in science keeping detailed notes on the climactic conditions as well as on the plants and animals of the region. The major portion of the parishioners of the Sitka Church are Russians, simple folk from various provinces, people having for the most part neither homes nor property nor morality (or having simply squandered these). Judging by this we must say that they are the worst members both of Church and society. Slowly, by spending time with the Tlingit people, learning their customs and language and ministering to them during a smallpox epidemic, they became open to hearing the Gospel of Christ from the priest. He supervised the building of St. Michael’s Cathedral in Sitka, for which he built the clock in the tower, along with the nearby Bishop’s residence. Both buildings still stand and are tourist attractions during the season in which cruise ships visit the port. I have visited the local church and was present there durin g the service. The interior of the church is magnificent, which could not be expected in a place like this. The priest is a manly, athletic man of about forty-five years of age, six feet three inches in height and very intelligent. He made a very favorable impression upon me. Having received his permission to examine his workshop, I saw there quite a good organ, a barometer and many other articles of his own construction. He was so kind as to offer his services to repair our two barometers, and repaired them very satisfactorily. In spite of the fact that he spoke in Russian only, we became very good friends. In 1838 Father Veniaminov was recalled to Russia to give a report on the progress of the Alaskan mission. By this time he had been in America for fifteen years and was the father of seven children. His travels took him to Hawaii and California where he visited a Roman Catholic mission and constructed an organ for the church. His ship stopped in Japan and he visited with the future St. Nicholas of Japan and instructed him in missionary principles. It was while in Russia that he received word that his beloved wife Catherine fell asleep in the Lord. Father John was encouraged to accept tonsure as a monk with the name “Innocent” and at the request of the Tsar was consecrated bishop of the new diocese of Russian America and Siberia. It is difficult to desc ribe in full the labors which this great worker took upon himself! Travel on reindeer, sometimes lack of food, inclement weather – even foul weather, hostile natives, and insults all around – all of this the elder endured patiently and in good humor. Often, when I would mention his incredible labors to him, he would tell me about patience and the rewards in heaven which await those who do good for God and their neighbor. Without rest for mine months the great elder preached the true God before hundreds of savages. With animation, zeal and often tears in his eyes he taught them the truths of the Gospel ...some 1,800 savages of both sexes were baptized during this period. It has pleased the Lord that even here, at the center of Russia and in my declining years, I have not become a stranger to the missionary work to which, by the will of Divine Providence, nearly my entire life since my early years has been devoted in the far-off reaches of our country. As he came to the end of his life he became completely blind, often serving the Holy Liturgy from memory. Feeling that his end was near, he received the Mystery of Holy Unction on Holy Tuesday of 1879, received a final Holy Communion on Holy Thursday and fell asleep in the Lord on Holy Sat urday, March 31, 1879. 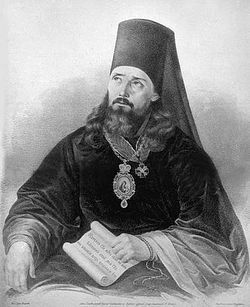 He requested that no eulogies to honor him be preached at his funeral but that a sermon be preached based on the words of Psalm 37 “The steps of a man are directed by the Lord.” The life of John Popov, later Father John Veniaminov, later Bishop Innocent truly were directed by the Lord. 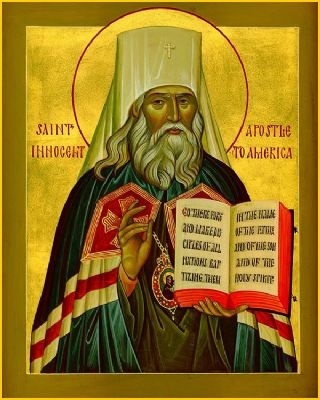 He was glorified as a saint with the title “Apostle of America” in 1977 and his relics are enshrined in the Trinity/St. Sergius Monastery near Moscow.